We posted a guest blog on the IBM Smarter Commerce Blog this week highlighting the need for a no compromise approach to Customer Experience Management tools and processes. The blog references some of the results from the IBM Holiday Digital Analytics benchmark, you can find the results of this benchmark on the IBM Digital Analytics Benchmark Hub. I would like to call out two of these recommendations and corresponding partnerships that we have established to provide a unique set of solutions that take advantage of the IBM Tealeaf capabilities and provide clients with industry leading offerings that effectively allow them to maximize the value of their Tealeaf investment and create a differentiated customer experience. 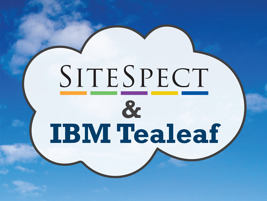 We have partnered with SiteSpect to create a private cloud implementation of IBM Tealeaf within the SiteSpect Cloud data centers. This enables companies to take advantage of SiteSpect's best in class testing capabilities and IBM Tealeaf's industry leading Customer Experience Management capabilities in a single integrated network environment. This combination reduces network latency and provides a seamless view between SiteSpect and Tealeaf. For further information on this offering, please click on the image below. In addition, we have partnered with Exchange Solutions to provide an integrated offering of Exchange Solutions unique customer engagement platform with IBM Tealeaf's rich customer analytic capabilities. Exchange Solutions is able to leverage that information by applying a proprietary rules engine to identify customer behavior gaps and then offer individualized incentives to encourage specific buyer behavior. This approach to Intelligent Customer Engagement provides the opportunity to maximize individual customer profitability and this can all be done with an innovative performance based pricing model that allows costs to be tied directly to results. To learn more about this joint offering with Exchange Solutions, please click on the image below. There is no reason to compromise when it comes to customer experience, when you have the opportunity to marry these industry leading online solutions for testing and customer engagment with IBM Tealeaf technology to improve the overall customer experience.